CAPE CANAVERAL, Fla. - NASA technicians performed a quick repair on space shuttle Discovery just in time to get back on track for a launch attempt today at 4:50 p.m. EST (2150 GMT). Following a successful fix to a chipped tile around the space shuttle Discovery's crew hatch, the space shuttle is ready to launch toward the International Space Station from Launch Pad 39A here at NASA's Kennedy Space Center. 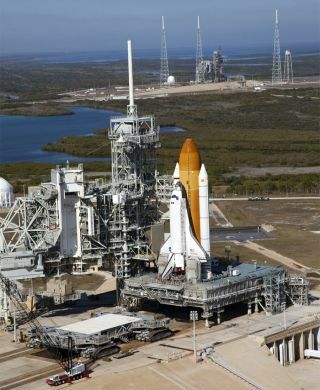 The mission will be shuttle Discovery's final spaceflight before being retired. "We're recommended to go ahead and continue at this time," said NASA test director Steve Payne following the repairs. "We're in a go configuration for flight." The issue arose when some of the black thermal covering on one of the tiles around the hatch of the shuttle's crew compartment was chipped when technicians at the launch pad removed some protective paper. Commander Steve Lindsey will lead the crew of six, including pilot Eric Boe and mission specialists Michael Barratt, Alvin Drew, Steve Bowen and Nicole Stott, on the 11-day STS-133 mission.